When you want to give your Lexus a sleek, modern look then adding chrome wheels is a great option. 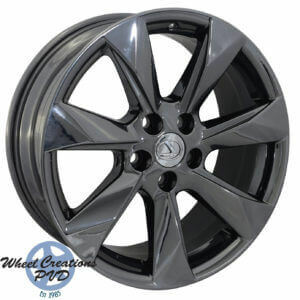 With Wheel Creations PVD you can exchange your stock wheels with our inventory of Lexus OEM wheels for chrome plating to create an understated luxury feel that you won’t find with other modifications. For Lexus vehicles, we offer rims in both bright and black chrome options so that you can create the right look for your vehicle. Browse our inventory and see how premium rims from Wheel Creation are a great fit to improve your ride’s appearance today. At Wheel Creation we use a unique Physical Vapor Deposition process when creating all of our Lexus chrome wheels. Each of the rims is placed in a vacuum chamber. Then the chrome is electrostatically sputtered on the rims. This creates a smooth, sleek finish that other chrome wheels you’ll find available can’t replicate. Every step of our time-tested process is 100% environmentally friendly and safe; making it an optimum choice for drivers of all kinds who want to upgrade their vehicle. While other manufacturers might want you to purchase new rims when you want a chrome upgrade, we’ve created a process that perfectly suits a Lexus’s OEM wheels. Chrome plating can be applied to any rims you have – send them to our facility, and we’ll take care of the rest. Regardless if you want rims with a sleek black look or in stunning bright chrome, we’ll provide a lasting finish that you’ll be proud to add to your Lexus vehicle. We sell wheels to dealerships, body shops, and direct consumers. Here, we’ve listed the PVD chrome wheels we currently have in stock. If you don’t see your Lexus’s model listed above, we can still work with you to get the perfect PVD chrome wheel for your Lexus. The chrome Lexus wheels offered by Wheel Creation are about more than just creating a great impression when you drive. We’ve developed a variety of techniques to give you the ultimate PVD solution. Those techniques create wheels that are tougher and more durable. They can withstand conditions that other chrome plated wheels can’t – such as curb rash, neglect, road chemicals, and more. You’ll never have to worry about peeling or corrosion with our rims. Our process can be performed on both vintage and OEM wheels, giving you great looking wheels for longer no matter which way you decide to go. See the difference that chrome rims from Wheel Creation can make for yourself. 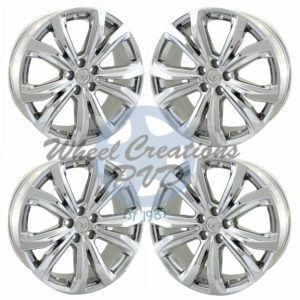 The extensive inventory of chrome wheels we offer isn’t just tough; they are affordable too. Whether you want something new for your vehicle or you want to upgrade the rims you already have, we provide the perfect luxury chrome solution. Give your Lexus some chrome wheels you can be proud of. Get in touch with our team of experts today to learn more. Call (562) 381-2670 or send an email message to sales@wheelcreationspvd.com and place your order today.